In a unique protest local residents of Vijaynagar in Changlang district of Arunachal Pradesh did not allow an Indian Air Force (IAF) helicopter to land at the Advance Landing Ground (ALG) on Wednesday. 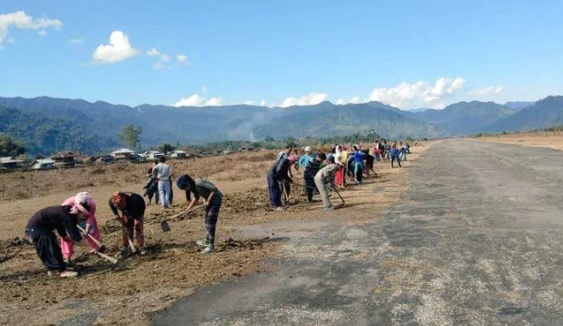 The villagers claimed that they cleaned the ALG runway on condition that the IAF choppers which return empty to Miao from Vijaynagar would carry cardamom produced by them. However, the chopper failed to do so. So as a mark of protest, the locals spread across the ALG runway of Vijaynagar to prevent the landing. Residents of 11 villages near Vijaynagar on January 20 cleaned the ALG runway of the grass and moss which had grown due to non-operation by any fixed-wing aircraft since 2016. The villagers also claimed to have spent Rs 150 for transportation of cardamom to Miao, the nearest town which is about 157-km away due to lack of road connectivity.